What do Amish wear to church? 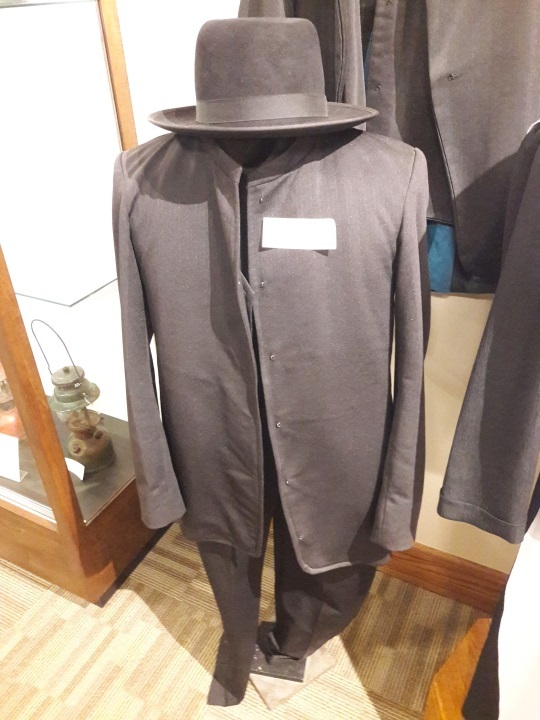 In addition to their many women’s head coverings, the Amish & Mennonite Heritage Center also has several items of church clothing on display. 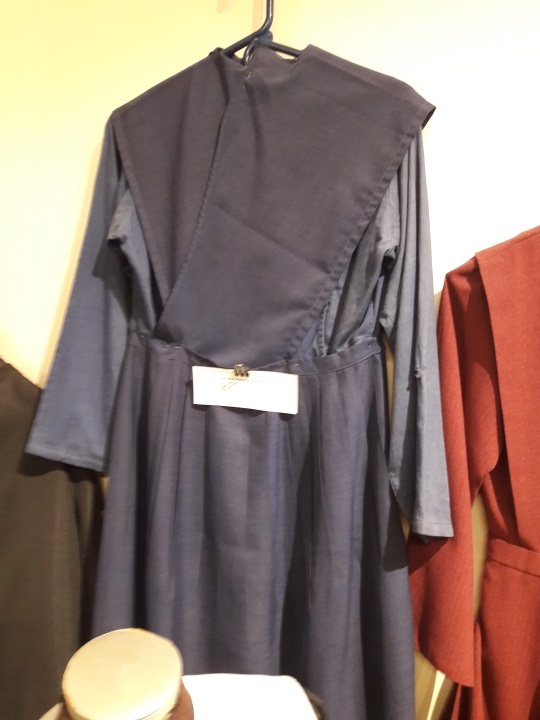 The cape and apron are commonly worn on Sunday across communities (we had a look recently at Amish wedding clothing, showing another example of this). Styles and colors can vary by community however. You will see capes and aprons in other colors besides the white above typical to Holmes County – including black and blue. White however tends to be common for church in many communities (Stephen Scott’s book on Plain clothing, Why Do They Dress That Way? gives a chart comparing styles across settlements). Unmarried girls may also wear different colors in some communities, such as in Lancaster County where they wear a white cape and apron, while married women wear a black cape and apron. The kerchief or cape is worn by nearly all plain women from all the various groups. It is also found in many surviving folk costumes of western Europe. Its wide appeal to pious country women is no doubt based on the modesty it provides. The extra covering is seen to conceal the neckline and the form of the bosom and provides privacy when nursing a baby. The apron, like the cape, has been regarded as an extra covering for the sake of modesty. Jacob Brubacher, a prominent Mennonite bishop of the 19th century is said to have made the statement, “The cape to cover the bosom, the apron to cover the abdomen. (Der Cape fer die Bruscht zudecke und der Shatz fer der Bauch zedecke. )” While many of the more moderate plain women have dropped the apron but retained the cape, the Old Order woman very rarely appears in public without an apron. Styles vary as well here. Steve gives the example of the Amish in Adams County, Indiana, who tie their aprons in the front. 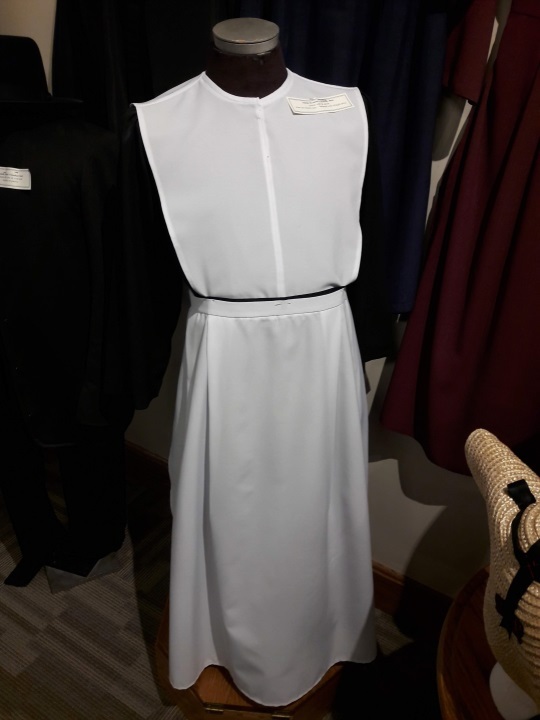 Outside of church, you might not immediately notice that an Amish woman is wearing a cape and apron because they may be the same color as the dress. The caps or prayer coverings women and girls wear to church will vary as well. 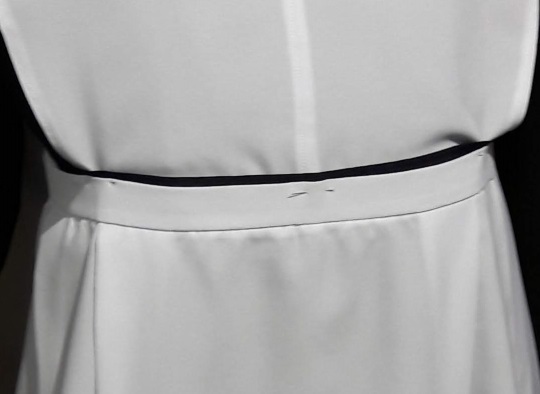 In most cases, girls wear black prayer coverings at church, while married women wear white. 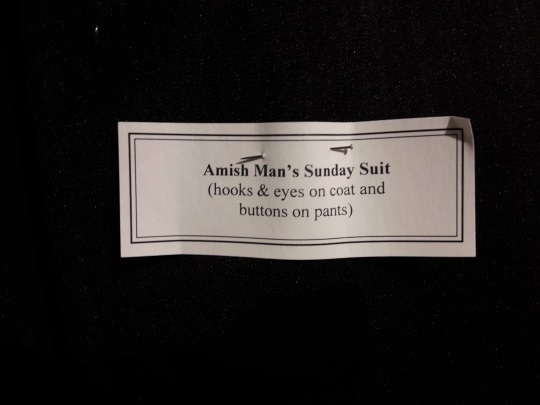 Next you have the man’s clothing – the Sunday suit coat with hooks and eyes. Wearing of the suit coat can vary. For example, in the community at Belle Center, Ohio, for regular church members it is seasonal, while ministers wear it year round. The Center also has on display what you might call an “heirloom” dress of Amish woman Mattie (Kurtz) Miller, who lived from 1880-1942. 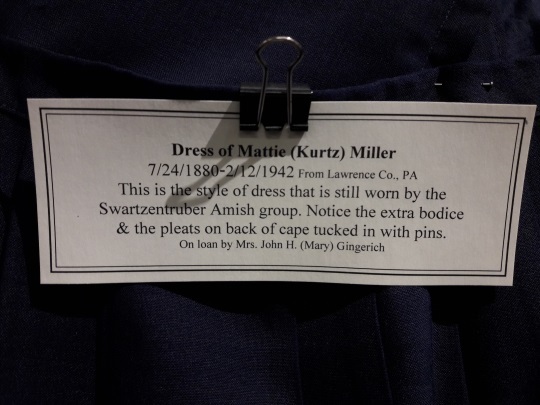 Mattie Miller, we’re informed, was actually from Lawrence County, PA (New Wilmington Amish), another plain group. It’s noted that this style is still worn by Swartzentruber women. There is an extra bodice, and the back of the cape is pleated. You can see the cape is a dark navy or gray color. For church, however, both Swartzentruber women and girls would wear white capes and aprons. 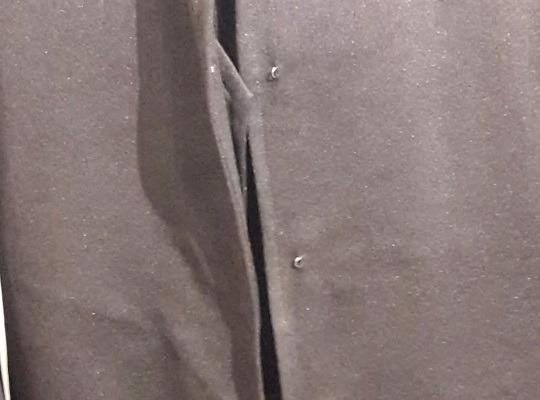 Why are women’s clothing put together with straight pins instead of buttons? Wouldn’t they get stuck often? I would guess it mostly has to do with tradition and doing things the way they have been done in the past…Amish will adopt changes in some areas but are more reluctant in others. Maybe it’s in part because this has to do with clothing which is a visual representation of identity (vs. say adopting some new tool that has nothing to do with church or identity). Buttons are considered “fancy”; zippers too. My opinion is that I think the women should be able to have either hook and eyes and or buttons. But not straight pins. 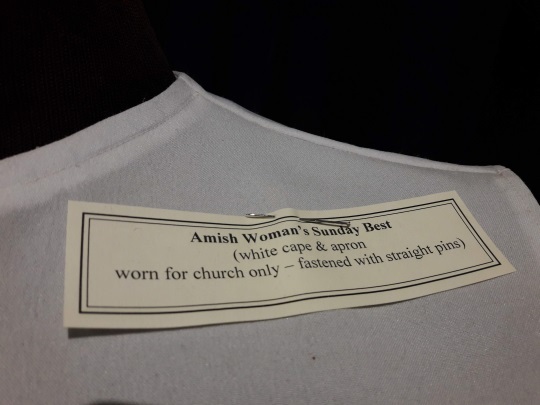 Only Amish women use straight pins to fasten their clothing together. Amish men don’t. I, for one really wish they didn’t, because their pins damage the upholstery in my vehicle, and, the pins frequently fall out. They don’t seem to care much about my personal property. They just care about maintaining a silly tradition. They could use safety pins, but they would say that’s too fancy. I wonder if they use straight pins in a baby’s diaper? If men use buttons and books for their clothing, what is the reason that women need to use only pins? I know this varies by church community, etc., but there must be a reason why it started that way. I would think women could use the time they save (using hooks & eyes or buttons) to get even more done ;). And yes, don’t they get stuck (or their kids, as in sitting on their laps?) It seems akin to wearing hair shirts (as punishment or a reminder of Christ’s suffering), back in the Middle Ages? Good questions Alice Mary, I don’t know how often it is that people get poked, seems it would happen often enough though. It’s not about hairshirts and inflicting intentional suffering for penance or some other reason…I don’t have an answer I can say with full confidence but what I wrote to Taylor above could apply here. This is off-topic, but I was wondering if you have any idea how the Midwestern Amish are faring in this extraordinarily bitter cold? I haven’t heard about extraordinary measures or changes like school cancellations but perhaps that came into play. Would be curious to hear more myself if anyone has heard any stories. In the Budget that came yest there were many comments in the letters about the cold temps. Life is miserable in any lifestyle when it’s -50! Hopefully there’s plenty of fuel for all the stoves that will be going in high gear! We’ve chewed the fat on buggy rides in winter if I remember right. Some buggies have a heater in them which would be great when you have a buggy full of little kids. And don’t forget the horses in such frigid temps and bring a horse blanket along. In my hometown a buggy shed was built just off the main street with room for four buggies. The horses will be out of the cold wind while the family is shopping. Today we are 60 degrees warmer than we were Wed and Thurs! Mon we had 10″ of snow and schools cloed; Tues we dug ourselves out and the wind showed up; Wed and Thurs the wind blew us into a -50 wind chill and the schools closed again both days; Fri it was still cold but no wind and we all said Yeah! Sat it got up to 40 above and rain was predicted; Today it is just plain sloppy out and we have water in our 165 year old basement! 🙁 So, us Englisch dig our heels in just like the Amish! The pins in the models were not put in as an Amish woman normally would. If put in the right way, the pin point is under the cloth and you can even run your hand over it and not get poked. The comments on it making it easy to change sizes is a very good comment. Part of it is also tradition and part is it allows a cape to be ironed flat and starched nicely and then for all the correct folds to be put in so it looks fresh and “correct.” I might add that in many more progressive groups, the use of pins is only for best dress-up clothes. Thanks for the additional detail Yoder! Thanks for sharing, Erik. I noticed the standing collar an the men’s suit coat is in line with the edge of the coat rather than notched at the top. Most of the Amish suit coats I’ve seen are notched (Lancaster County style being the exception) which give a bit of clerical collar look. Mennonite and German Baptist suit coats have the same notch with the standing collar and I know at least one person who was mistaken for a priest in his German Baptist coat. He told the man he wasn’t a priest and the man then complimented him on his Nehru jacket. Ah well. On the straight pins, I believe some communities use snaps instead.